The cost of preparing and submitting tenders for construction and engineering works is a significant expense to those firms involved and no participant can afford to be ignorant of the law surrounding the procurement process. This new book reviews the law concerning the procurement of construction and engineering works and services, and deals with the development of the common law of tendering including bids, offers, revocation of offers, acceptance and the making of contracts. This book is written from the perspective of English law but considers cases and statutes from a wide variety of common law jurisdictions, including Australia, Canada, New Zealand, Scotland, South Africa, and the US. 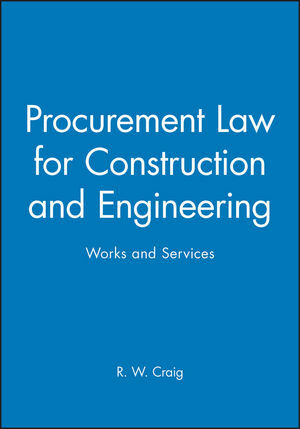 R. W. Craig is the author of Procurement Law for Construction and Engineering: Works and Services, published by Wiley.